Bryce Eiman is the heart & soul of the 919 Noise scene. On Perfect Fifths he weaves a tale of debauchery & destruction leading to calm & peace in 5 minutes of noise & dubbed out death disco. 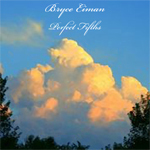 Bryce Eiman covers a lot of territory with ‘Perfect Fifths’. With only a minute he manages to touch upon a great deal of different approaches. From elegant to abrasive he understands each impulse of noise. What’s more he also employs relatively little explored aspects of noise such as sophistication, elegance, and restraint. Including these aspects brings ‘Perfect Fifths’ head and shoulders above the traditional noise monger. By introducing these styles he shows how diverse the noise genre can be. ‘3ws04’ starts off with something akin to Stilluppsteypa’s drone work. It glistens. The song simply stuns with its graceful approach and gradual build. ‘Ophir’ uses a beat workout as its main draw. On ‘Madness of the Middle Child’ things go into the very deep end, the sort of stuff Hecker handled on his first debut album. Little elements weave themselves in, bringing their cold selves in from the background. ‘Isotrope 05’ takes a page from Pan Sonic’s book. Here the beat is unrelenting. At times it feels like some sort of sick digital ritualistic sacrifice circle. It is a wonderful thing. Keeping to the repetition helps it gain power. Slight shifts confirm that Bryce Eiman is interested in further evolving the groove though sadly a minute is all that can be spared. ‘Caresse’ ends it on a lo-fi note. Far different from what preceded it the feeling is that of certain dread. Here Bryce Eiman is more interested in darker impulses. Together though these five pieces manage to create something moving, affecting even.